April 21, 2015 Couponing Post may contain affiliate links, Disclosure here. We have the right to refuse or limit the use of any coupon and/or the subsequent return for any reason and at the discretion of CVS Pharmacy management. Visit CVS.com/CouponPolicy for more information. If you are not satisfied with an item purchased from CVS Pharmacy, you may return the item, along with the original receipt, for a refund, exchange or store credit equal to your original purchase price. Cash, debit/credit card and check refunds must be requested within 60 days of purchase, along with the original receipt. Items presented for return without an original receipt may be exchanged for merchandise or a CVS Pharmacy MoneyCard. Valid customer identification is required. For your convenience, items may be returned to any CVS Pharmacy location. Personal checks made payable to CVS Pharmacy are accepted for the exact amount of the sale or less. Personal identification (ID type, ID number and phone number) will be requested from all customers who are making check purchases. CVS Pharmacy imposes no minimum purchase amounts for payments tendered with debit/credit cards or checks. Suave shampoo is on sale for $2.00 Buy One, Get One Free (BOGO) and thecustomer purchases two shampoos; the customer may use two coupons for $1.00 each and pay the applicable tax. Funded manufacturer’s/mfr’s coupons will generally calculate sales tax on the pre-coupon price of the item, as required by state law*. If the coupon is issued by CVS Pharmacy® (ExtraBucks Rewards plus ExtraSavings coupons that includes ExtraCare®Coupon Center and myWeekly Ad circulars), the coupon is generally deemed a retailer coupon and the sales tax is calculated on the discounted price of the item (after the coupon is applied), as required by state law. However, some CVS Pharmacy issued coupons are “funded manufacturer’s coupons” and designated as mfr. on the face of the coupon and also on your receipt. Sales tax is calculated on CVS Pharmacy issued mfr’s coupons on the pre-coupon priceof the item. You are able to send available deals and coupons to your ExtraCare card from CVS.com®, the CVS Pharmacy mobile app, digital receipts and CVS Pharmacy email. Click on the Send-to-Card® icon and view the success indicator on the landing page to ensure it was loaded properly. To use it, purchase the necessary items the coupon is valid for and ensure your ExtraCare card is scanned. The colleague will ensure it is applied to that transaction during the checkout process. 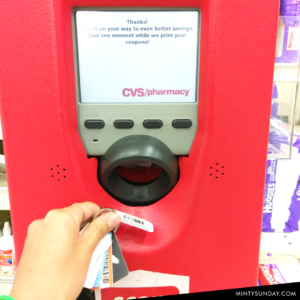 To Print a copy of the CVS Coupon Policy to take with you to the store – might come in handy!